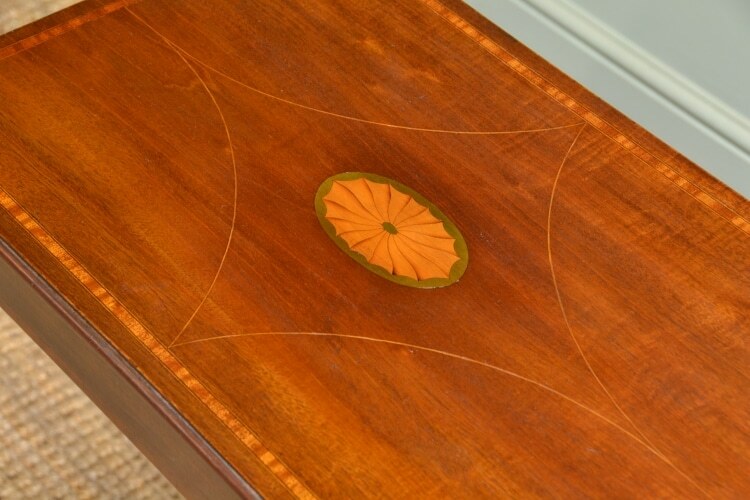 Antique Inlay on furniture can come in many different forms from floral, animal to marquetry or parquetry. 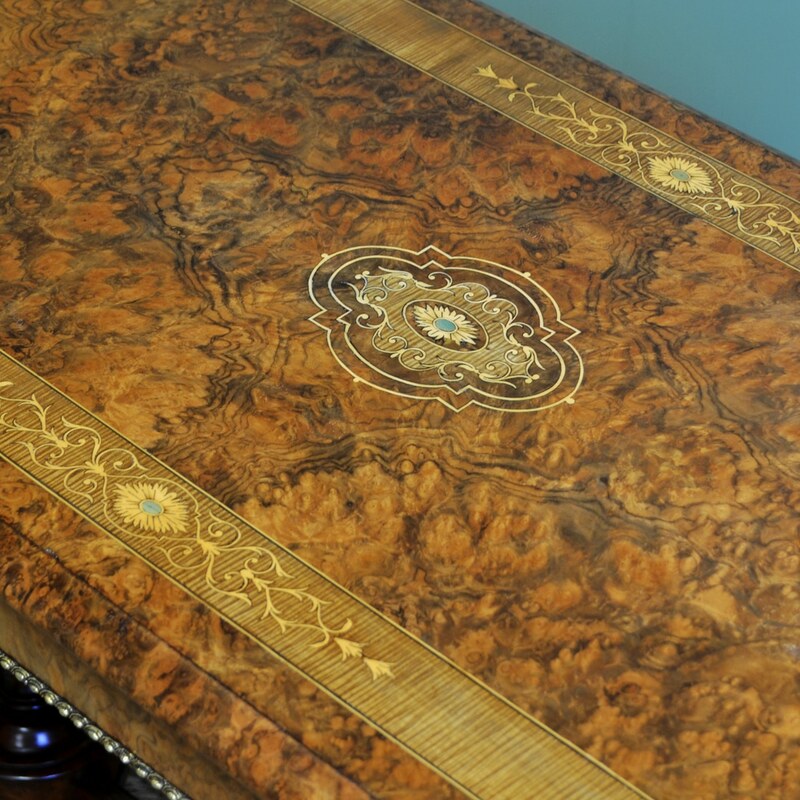 These inlays were mainly done on some of the finest pieces of antique furniture in exotic woods from Rosewood, Walnut to more unusual materials like Brass, mother of pearl, ivory or bone. 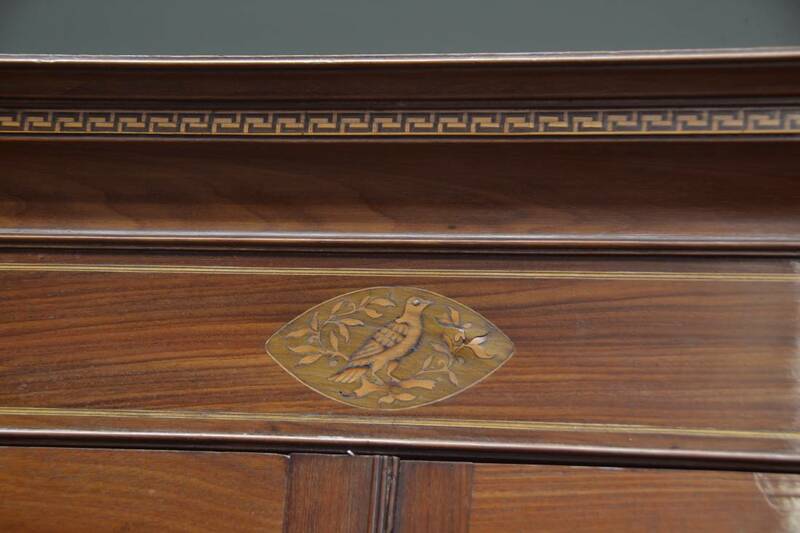 Simple inlay started from very early periods with simple feather banding on chests of drawers but in the Georgian and Regency era, this became more intricate with oval shells and urns inlaid in a variety of woods. 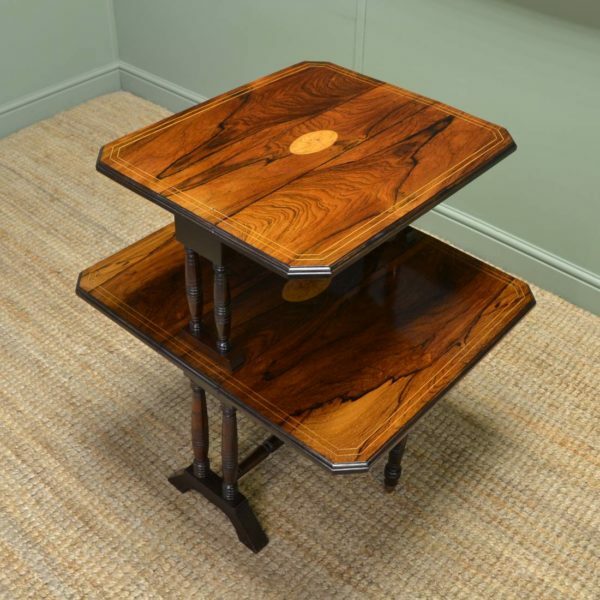 The Victorian period even produced specimen furniture with a small section of 100s of varieties of different woods on one piece. The Edwardian cabinet makers loved inlay, especially on bedroom furniture with lively images of birds and floral designs to swags and tails. 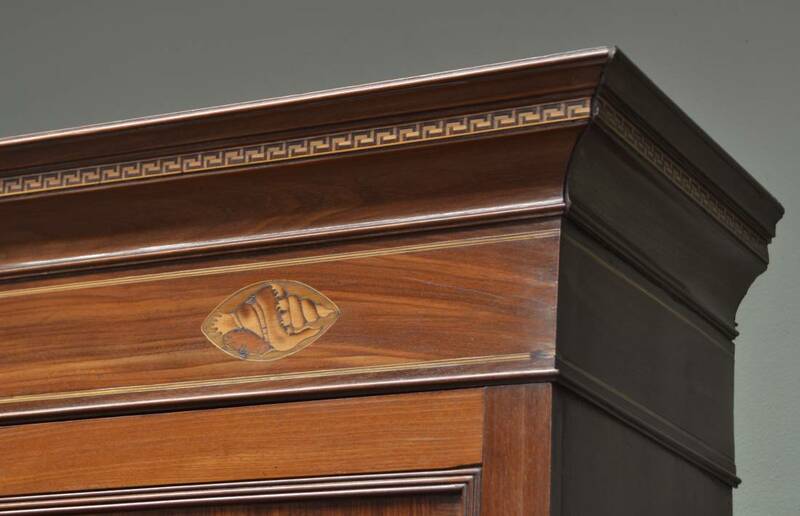 Inlay has been a big part of furniture design throughout history and is a very skilled bit of cabinet making. 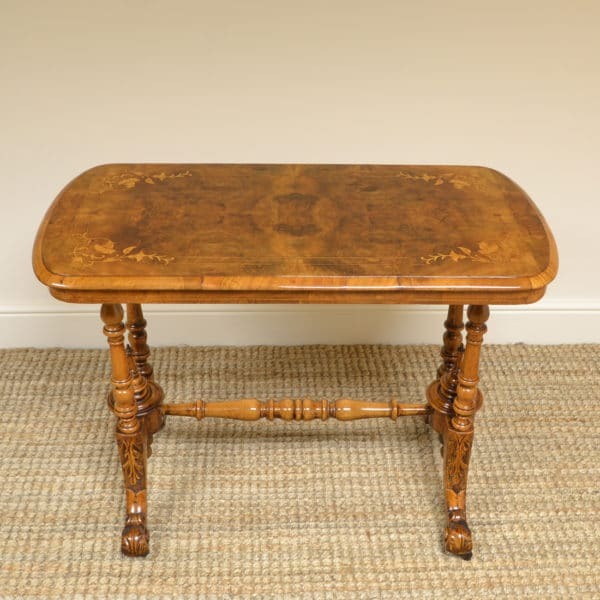 Antique pieces always have the best examples and today there would not be many craftsmen who could produce such magnificent pieces. Have a look below at our lovely examples available for sale. 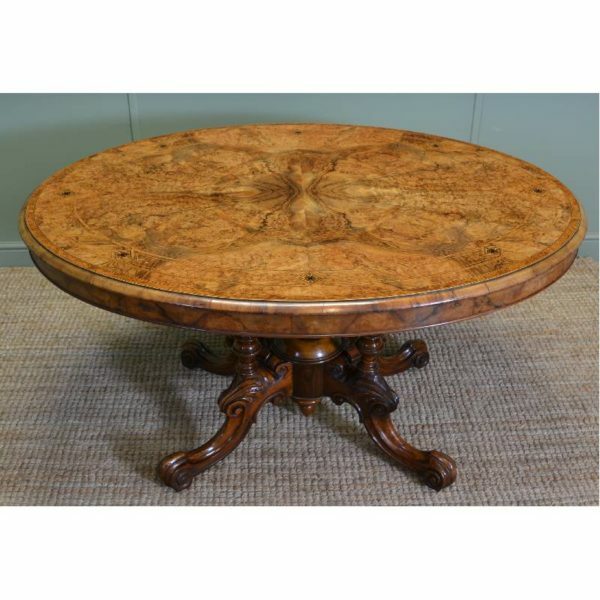 Magnificent Quality Figured Walnut Inlaid Oval Antique Dining Table. 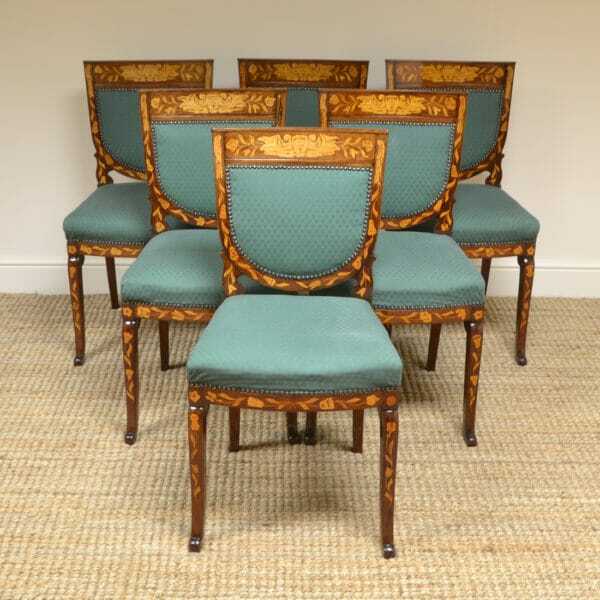 Below are a few examples of previously sold Inlaid furniture, but if any particular style looks of interest please let us know as we do get many similar designs in stock and we can try to locate something similar. 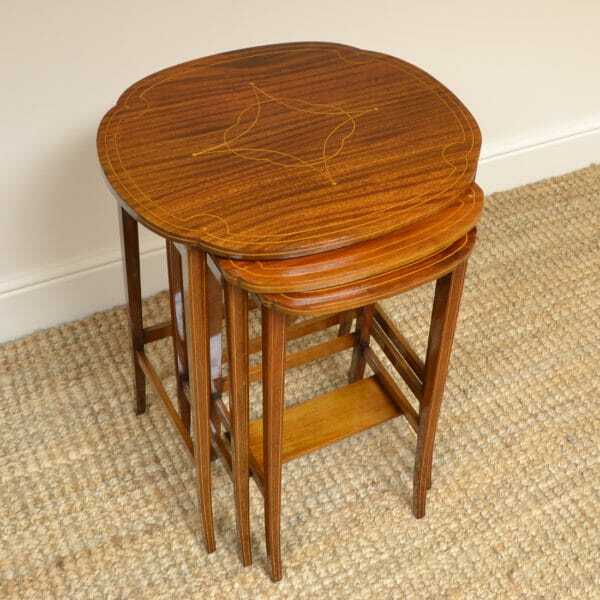 Quality Antique Edwardian Inlaid Mahogany Occasional Table. 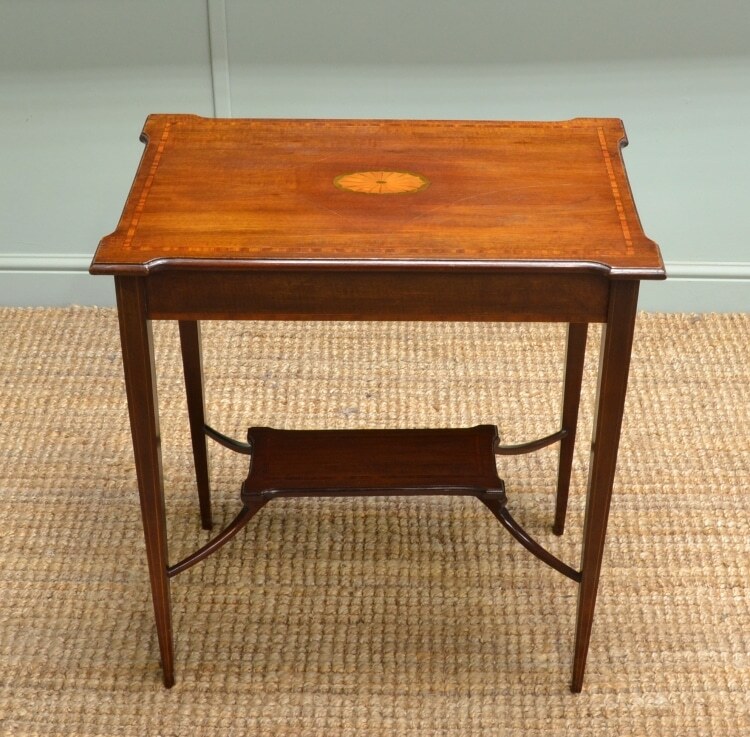 Dating from around 1900 in the Edwardian period this antique occasional table displays a beautiful inlaid top. The four tapering legs are connected by a lower shaped tier with elegant sweeping side supports. The moulded rectangular shaped top benefits from beautiful satinwood cross banding with boxwood and ebony string inlay with a fabulous floral decorative inlaid centre. 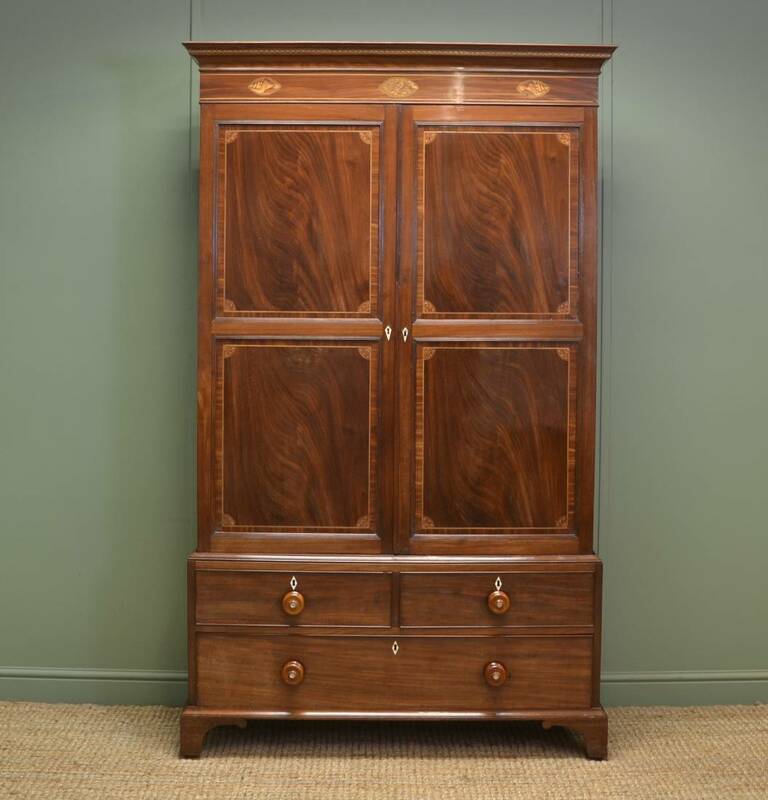 Superb Quality Inlaid Georgian Mahogany Antique Cupboard. 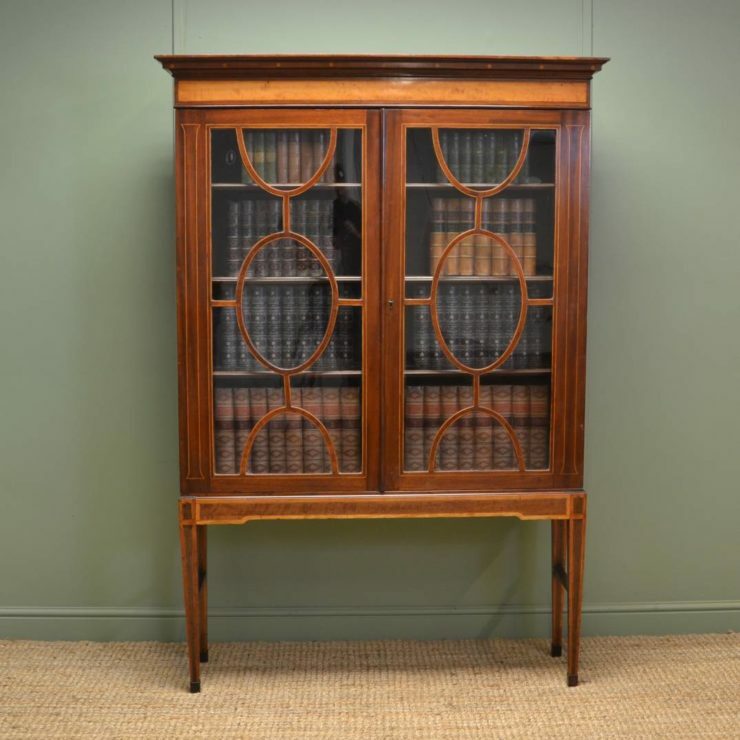 This Unusual, Superb Quality Inlaid Georgian Mahogany Antique Cupboard / Bookcase is of nice slim proportions and dates from ca. 1800. 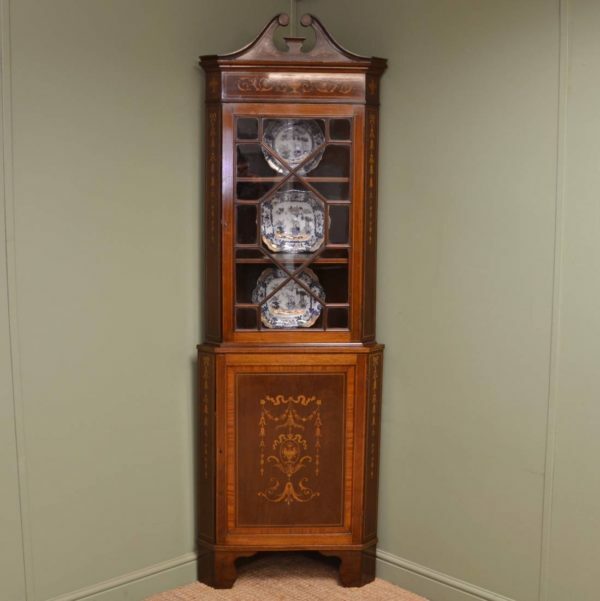 It has been constructed from the finest quality mahogany timbers and has beautiful inlays, so built by a true Master craftsman from the Georgian era. The piece has a moulded cornice with Grecian design decorative edge, above a deep frieze with detailed inlaid shell and bird oval panels. The two cupboard doors are beautifully figured, again with decorative inlays and cross banded edges. The panels have reeded sides, and the doors have diamond shaped key escutcheons with key and working locks. The interior has eight adjustable shelves. The base has two over one drawers with cockbeaded edges, beautifully turned handles that have mother of pearl inlaid centres. 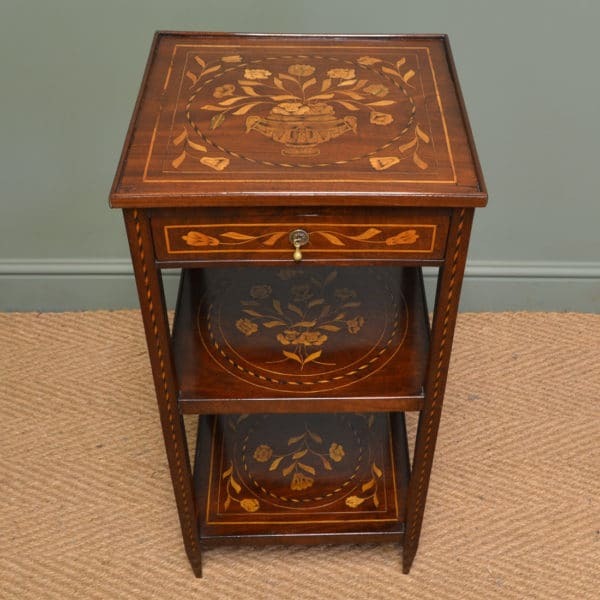 Victorian Inlaid Mahogany Tray Top Etagere. 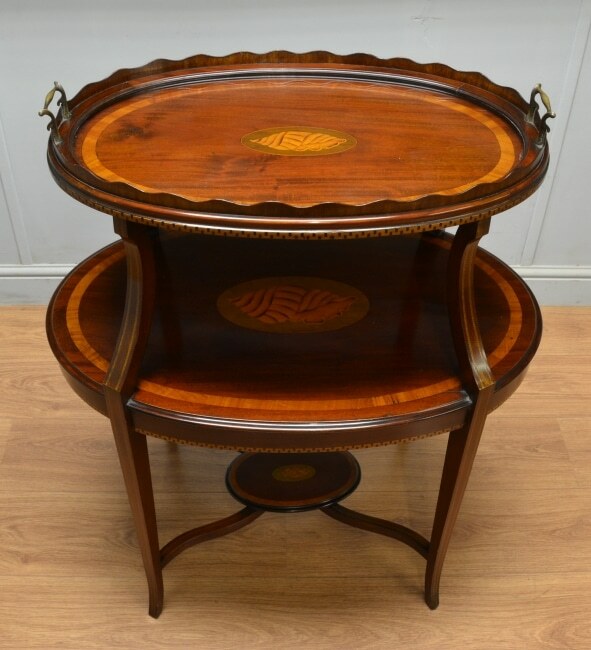 This unusual striking Victorian Inlaid mahogany tray top etagere ca. 1890 has a removable glass tray top with original brass handles. The tray top sits on a three tier serving table with oval moulded tops that have beautiful shell inlay centres and satinwood inlaid banding.